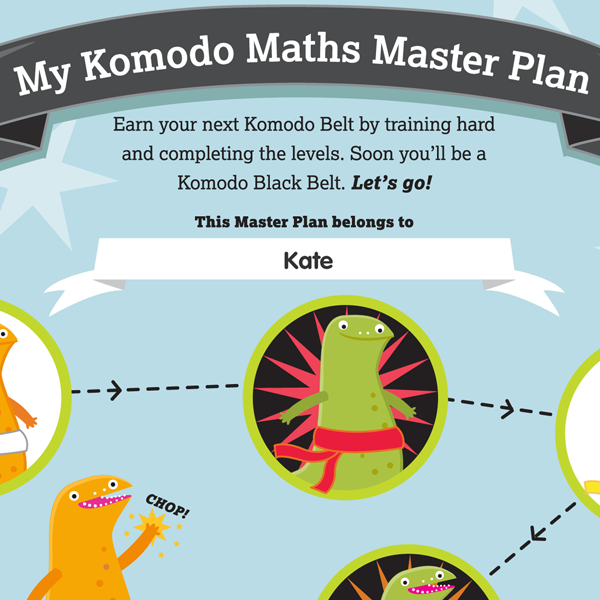 Belts are one of the ways learners are rewarded for their effort in Komodo, just like in martial arts. As children work their way through lessons on Komodo, they collect stage reward stars which they can swap for belts in the Reward Shop. All new learners get a welcome pack delivered to their house with a 'Mathematics Master Plan' sticker chart and belt stickers that they can stick on the chart when they've earned them in the app. When a learner earns a new belt, their electronic maths master plan is automatically updated. Learners can view their maths master plan in the second page of their learner menu. If you're the Boss, you'll get an email when the learner swaps reward stars and earns a belt. As learners work their way through Komodo, the belts require more stage reward stars, so each belt becomes even more of an achievement. Belts are earned in order: white, red, yellow, orange, green, blue and finally black. After reaching the black belt, learners can go on to earn bronze, silver and gold medals to pin on their belt. When your child achieves their black belt we will automatically send a new master plan reward sticker chart out to you, and the electronic version will appear in the learner menu in the app.